We are so excited for our new Acorn Internet Service web site to be launched! The Acorn staff is very helpful and always easy to work with. 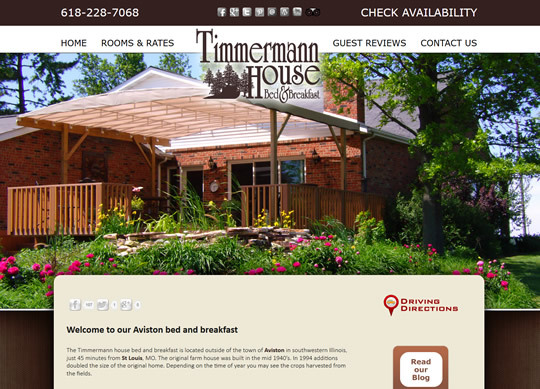 I was given a list of tasks to complete and Acorn took it from there putting together a site that is sure to bring more guests to Timmermann House Bed and Breakfast in the very near future. We had had our old site for over four years and it was out of date and not responsive or mobile. Blogging will be a new addition so stay tuned. Timmermann House will also be Tweeting, and Pinning. There are great pictures and content that show many of the things we have to offer including the ultimate in a relaxing atmosphere, flower gardens to stroll through and vegetable gardens, sightseeing, wineries and brewery, fabulous dinning and clean country air to breathe. Great place to stay & great hosts! We will be back after staying for many years including family.